Part rock, part jazz and part classical, Hello, Goodbye is all instrumental. In fact, OUiZZZ is billed as a “power jazz trio,” that title fits well. The boundaries between genres are blended and crossed throughout the set, and often within each track. It’s a fine disc for fans of music that lives outside the normal constraints of pop and rock. Although some might think of the Beatles song from the title of the set, actually “Hello” is the opening piece and “Goodbye” serves as the closer, making even the title an intriguing thing. While some people might be turned away by purely instrumental music, there is plenty to like in this set. Sometimes instrumental music can be tired and redundant. That’s not the case here by any means. This is always interesting and fresh. It’s challenging and yet accessible. It’s just plain good. 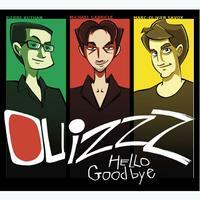 While the disc won’t be out for a while, it can be pre-ordered here: http://ouizzz.bandcamp.com/album/hello-goodbye or previewed here: https://soundcloud.com/ouizzz/sets/hello-goodbye-september-2012. Percussion opens the set at the start of “Hello.” As other instruments join, it’s unclear at first whether the song is going to be a new alternative rock number or something else. Piano creates the central melody as the rhythm section drives the beast. It’s got a lot of rock, but also jazz in the mix. It’s an intriguing cut that doesn’t feel that far removed from a lot of the alternative rock out there in the early sections. As it powers up more it’s perhaps closer to something like Radiohead. This has a killer bass line driving it. The keyboards lend some melody and also some dissonance. At times it feels a bit like something from Vince Guaraldi, but there is also a lot of that Radiohead sound in place. It’s one that wanders into more pure jazz territory, but also into something akin to space rock at times. There’s a great retro vibe to a lot of it. There’s a section later in the piece that has something that feels like a musical quote, particularly in terms of the rhythm section. A mysterious and dramatic rock element opens “Metal Bolero.” As it works out from there piano drives in some great melodic ways. It’s arguably the strongest cut on the set. It certainly has a lot of power and potent emotion. It calls to mind things like Diablo Swing Orchestra a bit in its melding of metallic and jazz elements. It gets rather dissonant and almost noisy later. This has more of a pure jazz element to it. The piano is the real driving force of the cut melodically. It’s pretty and quite tasty. It’s also a nice change of pace from the rest of the music to this point. This has a driving progression. The piano really works well to bring the melody and bass guitar dances around in the backdrop quite nicely. This starts in a very classical style. It grows out from there with an almost metallic edge in the plodding rhythm section that drives it. After a time it gets turned into something closer to a more standard melodic prog jam. More classical elements come in over the top as it continues. The piano really drives “Beautiful Carpet” with intricate lines of melody that at times feel classical and at other times give forth a real jazz vibe. In fact, it is a piano solo. “Goodbye” closes the set and it’s got a real hard edged, but rubbery vibe to it. It feels a lot like King Crimson in many ways. Some of the piano melodies seem familiar. The cut works through a number of changes in a solid and dynamic arrangement.